With so much chatter around how phones are making us more disconnected, we polled our team of tech experts for tips on how to use our devices for more quality time with the people who matter most in our lives. What’s for dinner? Good news! You’ve got options. Apps like UberEats, Grubhub and DoorDash allow you to order food without ever leaving your couch. The best part? They’ll deliver it to your door so you and your loved ones can spend as much time together as possible. In the cooking mood? Everyone can get involved in whipping up your family’s favorite recipe. Smart home devices like the Echo Show can pull up the recipe on its screen. You can follow along with the ingredients list or it will read each step out loud. Picture this: You have chicken on the grill, asparagus on the stove and grandma’s favorite pie in the oven. The one timer you have isn’t going to cut it. You can manage your multi-tasking in the kitchen with the help of your smart speakers such as the Amazon Echo and Google Home. Both allow you to label your timers to prevent confusion. You can say, “Alexa/Hey Google, set a chicken timer for 30 minutes.” “Alexa/Hey Google, set a pie timer for 45 minutes.” The best part? You can specifically ask how much each timer has left. No need to cry over burnt pie — just set the timers. Board games have long been a great way to spark interaction between family members. 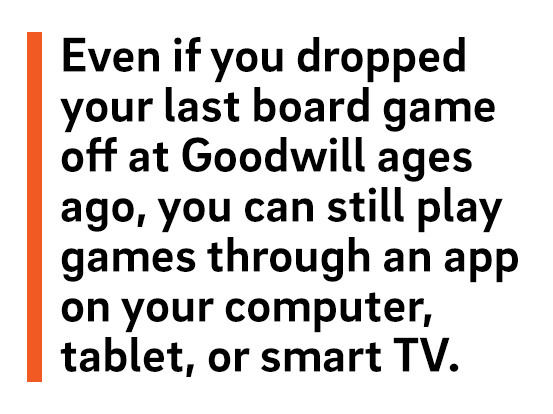 Even if you dropped your last board game off at Goodwill ages ago, you can still play games through an app on your computer, tablet, or smart TV. Most classic board game apps are inexpensive, super fun, and there’s less cleanup at the end of the night. To name a few: Monopoly, Risk, Catan. Never have enough controllers for everyone at the party? That problem stops with games like Fibbage, Psych! and Heads Up! Use your smartphone or tablet to get in the game. Ready to test your trivia knowledge against the rest of your family? Play Jeopardy! like a real contestant. Just say, “Alexa, play Jeopardy!” and select your category. On your Google Home you have tons of options like Mad Libs, Absolutely Amazing Trivia, Truth or Dare (a family-friendly version, of course). And then of course there’s a good old fashioned movie night… with a little twist. 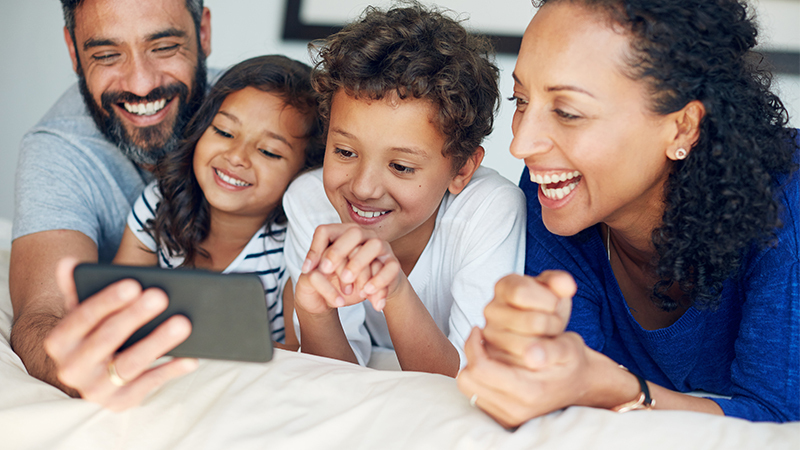 Once your family agrees on a movie (which sometimes takes longer than the actual movie) — you can decide how you want to watch it. Whether it’s on your connected devices from anywhere in your home or you even want to take it outside — gone are days of being limited by the power cord.